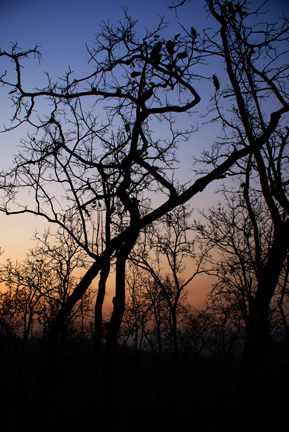 Pai, Thailand: The mahout woke me at 6:30, the sun just beginning to rise above a rather bleak landscape. I had asked to accompany him up into the hills to get the elephant Panom, where she had been foraging during the night and getting a little sleep; elephants generally sleep only three or four hours a night. It is February and rather cold at night. Pai lies about 134 kilometers west of Chiangmai. Once a small village settlement inhabited mostly by the Shan, it now survives and has grown through tourism. Still it has a population of only about 3000. It is here on the outskirts of the settlement where Panom lives and works in a small elephant camp. It is also the time of year when the villagers begin to burn-off the undergrowth. There is a pall of smoke that hangs over an already bleak landscape—teak forests, sparse and skeletal, blackened by the fires. It is up in these hills that all the captive elephants from various camps are brought each evening. Most of these elephants once worked with their mahouts in the forest industry. But the country was over-logged by the 1980’s, floods became prevalent and logging has been banned. Some of the elephant owners started their own small businesses catering to tourists who wish have an elephant experience and others were forced to, or chose to, sell their elephants. The landscape feels rather apocalyptic during this time of the year; large black boulders rise up from the shoulders of the hillsides like tombs. From a distance the elephants–their color and shapes—become invisible among the giant stones. We eventually located Panom where she had been tethered with a fifteen-meter long heavy chain. This allows her to cover enough area to forage during the evening, but, looking at the landscape, I found it difficult to imagine how they find enough food. Yet they do. It is an old daily routine and the elephant is always waiting for the mahout in the morning; she knows he’ll be there and she can easily hear his approach from a great distance. 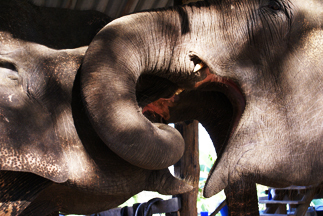 The chain is disconnected from the tree and the mahout instructs the elephant to pull the chain up in front of her where he then tosses it over her shoulder. Usually the mahout climbs upon the elephant but this morning he encouraged my friend Richard Wofford to have that position and we followed on foot. The mahout surrounds the elephant with a constant and gentle river of words, both encouraging and instructive. “pai” (go), “ma” (come), “sai” (right), “gwaa” (left). I suspect the elephant could easily navigate her way down without the mahout, but it might take all day, as she will often stop for any handy meal along the way. Elephants must eat almost constantly; they are inefficient processors of food and much of what they eat is returned to the earth still loaded with nourishment. Many other species take well advantage of this. Back at the camp, Panom and her friends are fed a huge helping of grasses and other tasty morsels. Beginning at mid-morning, tourists are waiting to be taken by the elephants down to the river or on various trails in the hillsides. Most of these small elephant camps don’t use howdahs; those clumsy wooden benches tied to the elephant’s back, but rather allow the human to sit up on the elephant’s back as the mahouts do. The elephants easily tolerate a strange person on their back as long as their mahout is close by with their constant ‘talking’ to the elephant. It is wise to take note that even as gentle as they appear and under the most benign circumstances, elephants, whether captive or wild, can be extremely dangerous. That afternoon we ambled down to the Pai River for a swim. The elephants enjoy the water and are excellent swimmers. 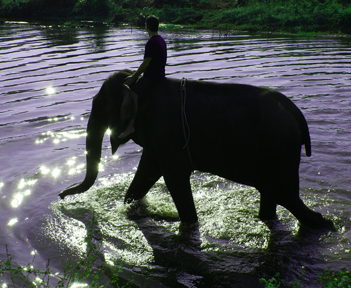 Once in the river, the mahout stays up on the elephant’s back along with the rider. One command instructs the elephant to blow water back upon the rider and another command will instruct the elephant to make a sudden lateral move. The elephant can easily dispatch a rider into the river with very little effort. After a lengthy swim, we all headed back to the camp along the river. I first met Panom slightly over a decade ago, returning every few years to visit. This last interval has been about four years and, in that time, Thom’s Elephant Camp has grown quite a bit. They now have about 8 cottages for rent and outdoor tubs filled with water from the local hot springs. 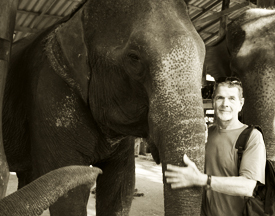 Thom and all the staff are quite friendly and informative; it’s a wonderful place to go and be with the elephants. As much as we might wish no elephants to be in captivity or those that are to be in a sanctuary, this is not always possible. But at least here, the elephants do not do ‘tricks’ to entertain the masses; their work effectively supports themselves and, as well, the mahouts and their families. Once back at the camp, Panom greeted her good friend, an even larger elephant, with very tender gestures, communicating feelings that remain unknown to us. For the next long while I sat and watched the elephants. 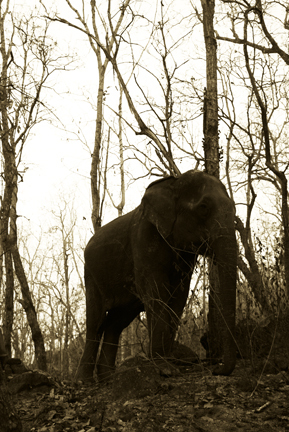 Panom, now fifty years old, grew up with her original mahout, who recently passed away. It is his daughter Thom, who also grew up with these elephants, who is charged with keeping them and all the mahouts fed and as happy as possible. Today, there are only about 5000 elephants in Thailand; roughly 3000 are wild and the rest captive. At the beginning of the 1900’s, there were approximately 300,000 elephants in Thailand and 100,000 were in captivity, used primarily as work animals. What is critically important is that the wild elephant population and its diminishing habitat be protected. Even if no more elephants were captured, without sufficient habitat, the species cannot be sustained. On their successful sustainability lies the success of numerous other species that directly depend upon their presence. These essential symbiotic relationships have grown together over millions of years. It has been only recently that humans and our self-indulgent needs have dangerously altered the necessary balance of our home—this planet and all of its inhabitants. As for the elephants that remain in captivity, they can never be ‘wild’ elephants. They can never experience life, as do their relatives, in the wild. But like all creatures, whether domestic, captive or wild, it is up to us to care for them. How we do it will ultimately determine our own success as a species. At five o’clock, the day is over for the elephants. Their mahouts gather the long chains and place them back over the elephant’s shoulders then climb once again on the elephant’s back and lead them up into the hills. This story, wonderfully told, so comes alive for me, Galen- it brings me back to my one day in a similar encounter, not far from Pai. Your words are the kind which are worthy of repeated readings-much there, bright spirit-not easily absorbed all at once!